Before the Vitality Netball Superleague season even started, Georgina Fisher was hotly tipped to be one to watch in 2016. At the tender age of 17, the teenager from Hoddeston shows unbelievable amounts of promise and an incredible level of talent. In 2014, the shooter was named in the England under 17 squad for the European tour against Scotland, Ireland, Wales and Malta. She was the youngest player in the squad and a year earlier had been selected into the England programme aged just 14. 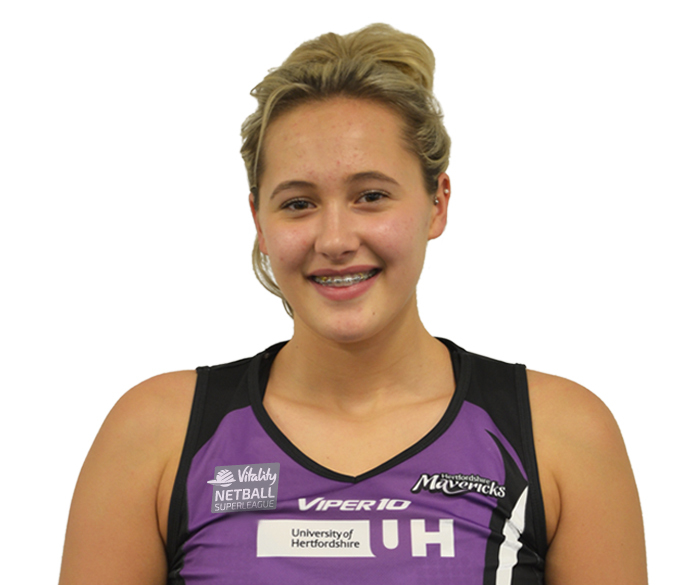 Fisher has been excelling on the netball court from a very young age and has been knocking on the door of the Superleague, and the Hertfordshire Mavericks for a long time. This season has seen Fisher named in England Netball’s High Performance Programme and she was also named as one of two reserves for England’s Test Series with Australia in January – pretty impressive for a 17 year old! In her first Superleague season, Fisher will be looking to make an impact in a much-changed Hertfordshire Mavericks squad – and she’s doing that already. At the start of Round 5, she was 9th in the goals scored table for the Vitality Netball Superleague and had the best shooting percentage of all her peers. Her play is fantastic and a definite string to Fisher’s bow is her fearless approach to shooting – she’s no stranger to a long-range shot and puts the ball up with confidence. She also commands the circle, has a very strong hold, but can lead out and also distributes the ball with ease. Fisher is, without a doubt, making huge strides in the Superleague and is making herself known on the international stage. If there’s a group of ones to watch this season, Georgina Fisher is definitely with them!